That’s right, the Evangelion merchandising department has finally reached the bottom of the barrel, and have decided to sell that too. 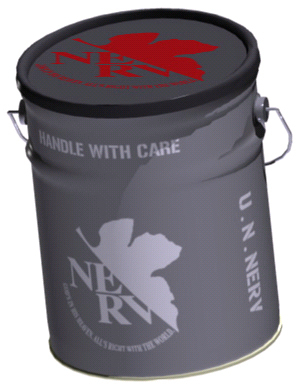 The “NERV pail” is 30cm (11.8in) in diameter and has a capacity of 20L (5.28gal). Suggested possible uses for the “NERV pail” include a housing for garbage, and with the addition of a few cushions, a simple chair. The “NERV pail” will be released in early August, and will sell for ¥4,980.